As my contribution towards celebrating 5 years of Trove I've been text correcting the OCR in the family notices section of The Kapunda Herald and Northern Intelligencer.- 1864 -1878. Both maternal and paternal sides of my family resided in this area in South Australia during those years covered by the paper and I have found many notices relevant to my family history. As there were only a few hundred notices to edit thanks to some previous editors, this proved to be an achievable task. Editing family notices really brings home to one, how lucky we are to be alive. Here's a family in 1875 who lost 3 children in 14 days. BARRETT.—On the 31st of March, at Mr. J. O'Dea's, Waterloo Plains, of convulsions, Mary Barrett, daughter of James and Maria Barrett, of Tothill's Creek, aged 3 years and 9 months. BARRETT.—On the 6th of April, at Mr. J. O'Dea's, Waterloo Plains, of scarlatina, William. Michael Barrett, son of James and Maria Barrett, of Tothill's Creek, aged 10 months. 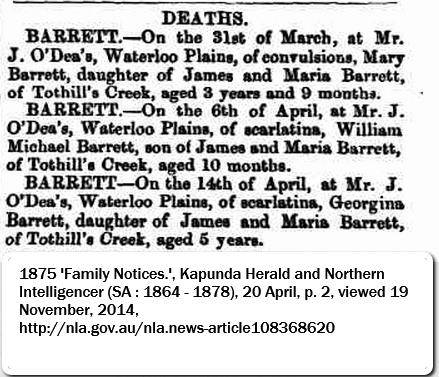 BARRETT—On the 14th of April, at Mr. J. O'Dea's, Waterloo Plains, of scarlatina, Georgina Barrett, daughter of James and Maria Barrett, of Tothill's Creek, aged 5 years. Then in 1879 another sad tale as Charles Smith loses his wife and infant son on consecutive days. SMITH.—On 3rd January, at Boucaut, of consumption, Charlotte, the beloved wife of Charles Thomas Smith, and third daughter of the late John Baker, formerly of Kapunda aged 25 years. Also, on the 4th January, of diarrhoea, Gilbert Thomas, infant son of Charles Thomas and Charlotte Smith, aged thirteen months, "Not lost, but gone before." 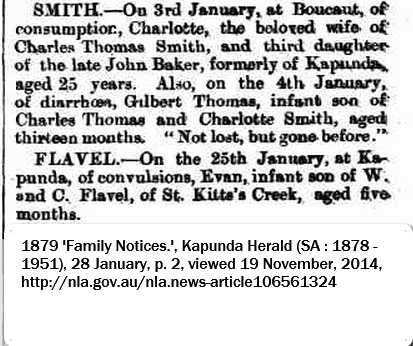 FLAVEL—On the 25th January, at Kapunda, of convulsions, Evan, infant son of W. and C. Flavel, of St. Kitts's Creek, aged five months. Life was tough and many children lived short lives. This older couple died on consecutive days having been in the colony since early its settlement. BELL.—On the 21st of August, at the residence of her son, Hamley Bridge, of bronchitis, Anne, the beloved wife of Joseph Bell, sen., aged 69 years. 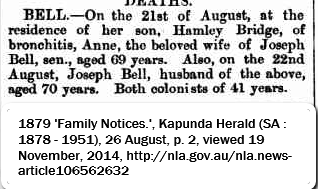 Also, on the 22nd August, Joseph Bell, husband of the above, aged 70 years. Both colonists of 41 years. We have so much to be thankful for, advances in medical care and facilities, rapid transport options and so many other comforts we take for granted as our daily lot. Thanks Trove for providing these insights into our past.